Thyroid disease is a medical condition which affects the thyroid gland and/or its ability to properly produce thyroid hormone. Thyroid hormone is important in regulating many essential functions within the body. Patients who are diagnosed with thyroid dysfunction are typically treated by an endocrinologist, who has advanced training to diagnose and treat the various type of thyroid dysfunction and thyroid cancer. Goiter: Enlargement of the thyroid gland. Thyroid disease can affect anyone, but women are 5 times more likely to be affected than men. Approximately 1 in 8 women will experience some type of thyroid problem or disorder during her lifetime. The thyroid is a butterfly-shaped gland which is located at the front of the windpipe (trachea) at the base of the throat and is an integral part of your endocrine system. Thyroid function is regulated by the secretion of TRH (thyroid releasing hormone) from the hypothalamus, that signals the release of TSH (thyroid stimulating hormone) from the pituitary gland. TSH then travels through the blood stream to stimulate thyroid hormone production by the thyroid gland. Dysfunction can occur with damage or interruption at any of the essential steps in thyroid homeostasis: hypothalamus, pituitary or thyroid glands. Diagnosing thyroid disease begins with a complete physical examination that includes palpation of the neck to identify any enlargement of the thyroid or evidence of nodules. Because many thyroid disorders can present with similar symptoms, additional diagnostic testing may be recommended to determine the type of thyroid disorder, that may exist. Thyroid uptake and scan: Imaging procedure in which small amounts of radioactive isotopes are utilized to determine the size, shape, position and function of the gland or nodules. This is often referred to as the radioactive iodine uptake (RAIU). Fine needle aspiration (FNA) and biopsy: A technique that uses a thin needle to obtain cells from the thyroid gland or a nodule for further evaluation by a pathologist. For best accuracy the use of sonography during the biopsy is advised. 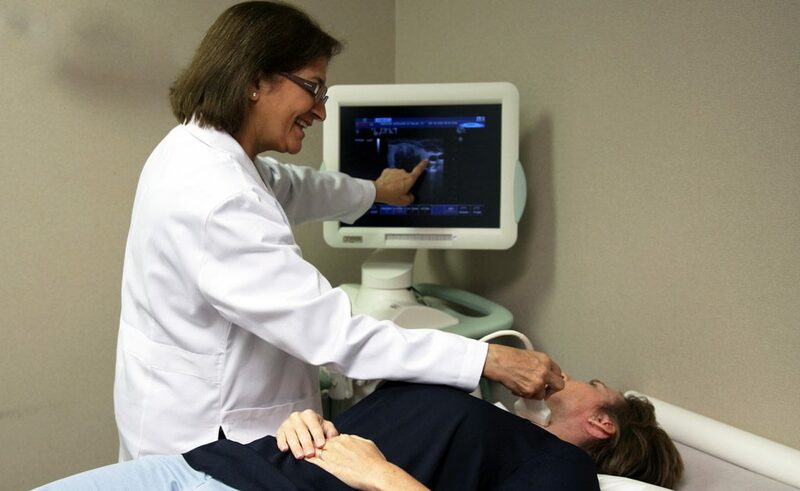 Our physicians at Endocrine Associates of Dallas and Plano have training and expertise to provide in-office ultrasound. If a molecular diagnosis is needed to evaluate for malignancy, our physicians complete ultrasound guided fine needle aspiration and biopsies. The presence of a goiter is not necessarily indicative of a malfunctioning thyroid, however, goiters are often a symptom of an underlying thyroid disorder. When goiters are diagnosed, testing for a thyroid disorder is necessary. Hypothyroidism occurs when the thyroid gland does not produce a sufficient amount of thyroid hormones. When hormone levels fall too low, normal chemical reactions within the body and important bodily functions are disrupted. Hypothyroidism is often asymptomatic and symptoms can progress over time. Autoimmune disease: Conditions such as Hashimoto’s thyroiditis and other disorders of the immune system can cause antibodies to attack the thyroid and hinder hormone production. Medications: Some medications, such as lithium or amiodarone, can affect thyroid function. Treatment for hyperthyroidism: Radioactive iodine and/or anti-thyroid medicines used to treat hyperthyroidism (overactive thyroid) can, in some cases, result in permanent hypothyroidism. Thyroidectomy: Total or partial removal of the thyroid often results in hypothyroidism. Radiation: Cancer treatments which involve the head and/or neck can damage the thyroid. Congenital disease: Babies can be born with a nonfunctioning thyroid due to abnormal development, absence or misplacement of the thyroid gland. Pituitary dysfunction: If the pituitary gland fails to produce enough TSH, the thyroid is affected. This can be due to medications, illness, pituitary abnormalities or trauma. 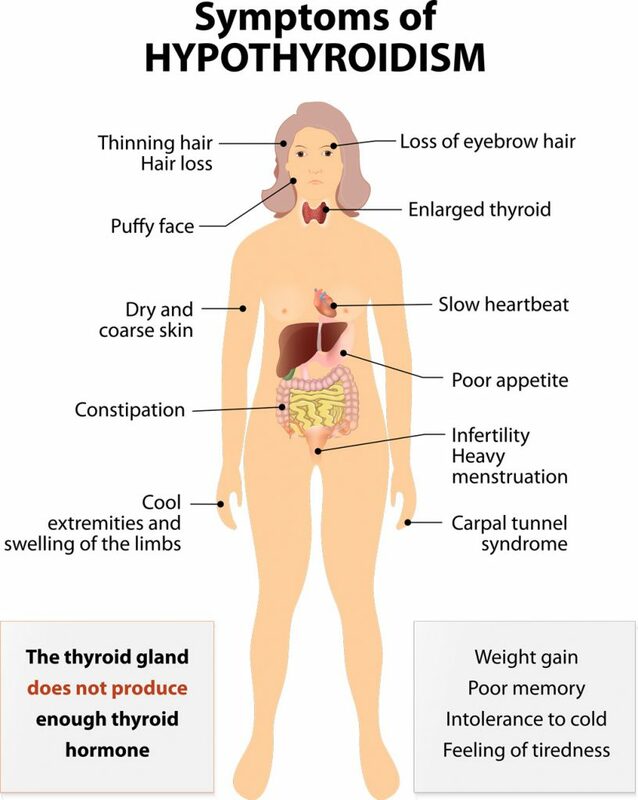 Hypothyroidism is treatable with thyroid hormone replacement. There are several options for thyroid hormone replacement (synthetic and animal derived). Thyroid hormone replacement is specific to the patient. 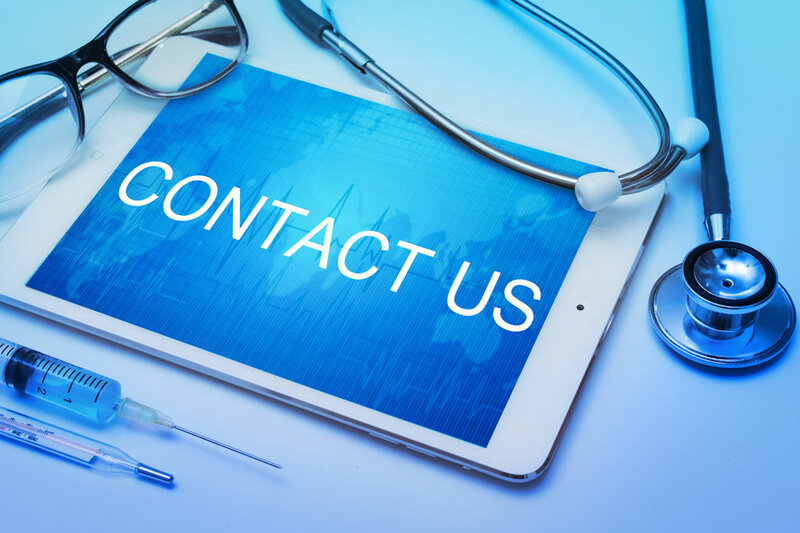 The Endocrinologists at Endocrinology Associates of Dallas (EAD) and Plano will assist you to determine your best treatment option. Most patients diagnosed with hypothyroidism will require lifelong treatment. Hyperthyroidism is the result of the thyroid gland overproducing thyroid hormone. Hyperthyroidism can be due to autoimmune and non-autoimmune etiologies. The classic form of Hyperthyroidism is termed Graves’ disease. Graves’ disease is an autoimmune process that occurs when one’s own immune system produces an antibody, called thyroid stimulating immunoglobulin (TSI). TSI stimulates the thyroid gland to enlarge, producing a goiter, and causes overproduction of thyroid hormone, resulting in hyperthyroidism. Treatment for hyperthyroidism will depend on the severity of your condition. Anti-thyroid medication: Thionamide treatment prevents the overproduction of thyroid hormone. 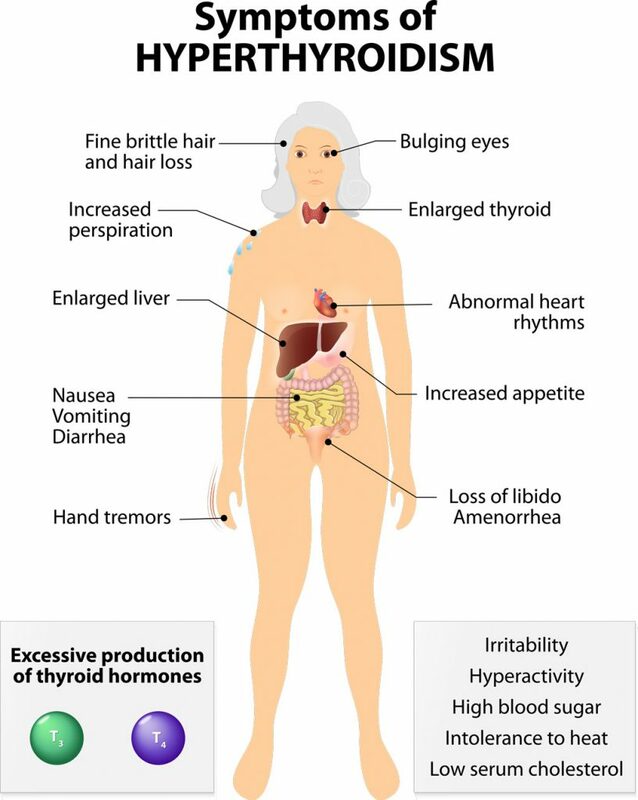 Thyroid hormone levels are normalized and symptoms reduced. Most commonly used are methimazole and propylthiouracil (PTU). Thyroidectomy: Surgery involving the removal or partial removal of the thyroid. Thyroiditis occurs when the thyroid becomes swollen or inflamed. Thyroiditis can result in hormone levels being high or low. Commonly, thyroiditis is due to an attack by the immune system, which is often caused by an auto immune disorder, such as Hashimoto’s disease. Other causes of thyroiditis include severe illness, medications, bacterial or viral infections. Thyroiditis typically occurs in 2 phases. In the initial phase, the thyroid overproduces hormones and the patient may experience symptoms of hyperthyroidism. Overtime, the patient will transition into the second phase, a hypothyroid state. Due to symptoms, thyroid supplementation is often needed. Thyroid function can return to normal and not require lifelong treatment. The entire cycle of thyroiditis can last 6-18 months. Our physicians at Endocrine Associates of Dallas will help monitor your condition and discuss appropriate treatments. A benign thyroid nodule typically requires no treatment unless it shows signs of growth. 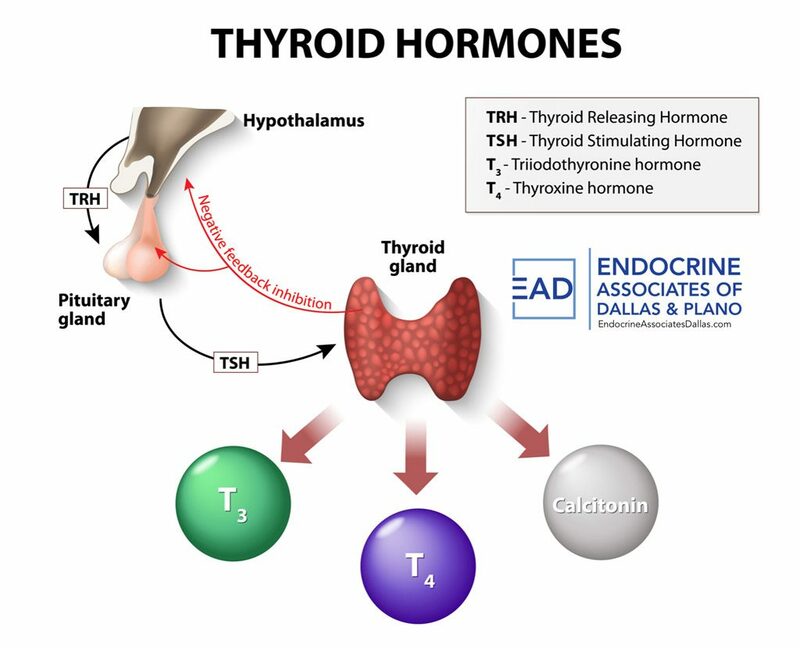 The physicians at Endocrine Associates of Dallas and Plano will perform blood tests and thyroid imaging to determine the appropriate course of treatment. A nodule that is enlarged or potentially cancerous will require an ultrasound guided fine needle aspiration. Endocrine Associates of Dallas sends tissue from a thyroid biopsy to a laboratory that is able to use traditional cytology and molecular techniques to determine the best diagnosis of the tissue present in the nodule. If there is concern for malignancy or the nodule is causing any compressive symptoms, the patient may require surgery. 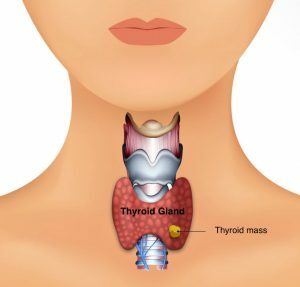 If you are experiencing symptoms of a thyroid disease, please ask your doctor for a referral to the specialists at the Endocrine Associates of Dallas & Plano. Thyroid cancer occurs in the cells of the thyroid. The lifetime incidence of thyroid cancer is approximately 1.2% of men and women (https://seer.cancer.gov). The rate of thyroid cancer seems to be increasing but this increase may actually be due to the advanced imaging technologies used to evaluate other conditions. Thus, these nodules are incidental findings and have resulted in an increased rate of detection of small thyroid cancers not previously detected. Thyroid cancer occurs when cells in the thyroid gland undergo genetic changes (mutations). These mutated cells are not normal and multiply. These abnormal cells can spread to areas outside of the thyroid gland, most commonly the neck and chest. Thyroid cancer is three times more common in women than men. Exposures to high levels of radiation due to incidental contact or patients with history of head and neck radiation in childhood will have a higher risk to develop thyroid cancer. The most common types of thyroid cancer are Papillary and Follicular thyroid cancer cell types. With proper surgical and medical treatments, most of the time, patients have excellent outcomes. Less common and more aggressive thyroid cancer cell types include, Anaplastic, Lymphoma and Medullary thyroid cancer. Hereditary syndromes associated with thyroid cancer includes Cowden syndrome, familial medullary thyroid cancer and multiple endocrine neoplasia (MEN2). Early surgical intervention and close follow-up is necessary. Between 2008-2014- 5 year survival was 98%. Research studies have provided long term outcomes of different types of cancer. Using this knowledge, treatment regimens require less use of radioactive iodine than was previously recommended. The size of the tumor, pathology, preoperative assessment and having surgery by an experienced thyroid surgeon are vital to improve rates of remission and lowering recurrence of thyroid cancer. 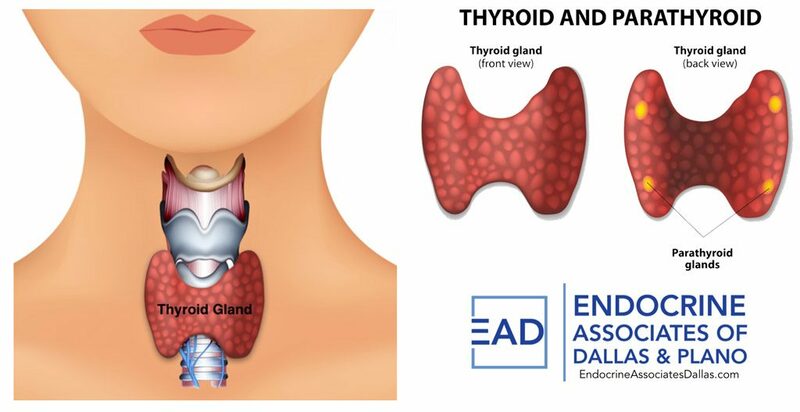 Our physicians at Endocrinology Associates of Dallas (EAD) and Plano understand the worry that a diagnosis of thyroid cancer brings to the patient and family. We use the latest guidelines to guide our patient’s through the process of treatment for the best outcomes. We welcome the opportunity to partner with our patients to determine optimal interventions and treatments for their thyroid disease.